Imagine a power plant in the middle of a wildlife sanctuary. Try to picture an energy source as a work of art. That’s exactly what the Land Art Generator Initiative asked designers and architects to do. For its second site-specific design competition the non-profit organization (LAGI for short), sought to inspire plans for land art installations with the duel function of being both ornamental attractions for visitors and sources of renewable energy. This time the initiative found a kindred spirit in a parks department that has asked citizens to envision a dumping ground as a place of natural beauty. When LAGI’s directors were considering places on which to focus their 2012 contest, New York City’s Freshkills Park seemed like the ideal choice. The location’s transformation from what was once the world’s largest landfill to a 2,200-acre preserve is now being undertaken in stages over a 30-year development phase with a similar intent as the one informing LAGI’s own mission — questioning assumptions and repairing environmental damage with smart sustainable methods. And when it comes to alternative energy, the park has already begun harvesting methane from decomposing garbage to heat area homes. 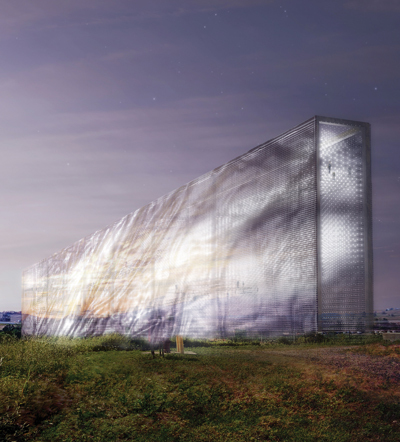 In LAGI’s ultimate goal of one day witnessing the construction of “the world’s first work of public art, slash sustainable utility-scale power plant,” environmental stewardship goes hand in hand with the establishment of a public gathering place, just as it does in the ongoing overhaul of Freshkills.